Become an “employer of choice” organization. Succeed in organizational change initiatives. Adapt to changing business conditions more readily. Commit to a healthy workplace. Donna will work with you to design a program around the specific needs of your organization. Her programs may be offered in a variety of lengths and formats, including group settings, Internet, phone consultations, one-on-one coaching sessions and homework assignments with support materials. Finding and keeping alive your Sense of Humor, Sense of Fun, Curiosity and Adventure! Organizational commitment to a basic strategy. Initiative to stimulate improvements in performance. Open communication and trust-building with all stakeholders. Building relationships inside and outside that offer competitive advantage. Collaboration, support and sharing of resources. Innovation, risk taking and learning together. A passion for competition and continual improvement. A balance between the human and financial side of the company’s agenda. The smooth integration of acquisitions. The ability to give and receive feedback in a timely manner, with respect and grace. Feedback that is useful and helpful to the employee such that they can leverage their assets. Based on the seminal work of Richard Boyatzis and Dr. Daniel Goleman, the ECI builds on Hay/McBer’s 35 years of competency research and proven methodology for the full spectrum of emotional intelligence. The result is an assessment and development tool of unmatched precision and authenticity. The ECI is the only instrument that incorporates the full depth of my research and that of my colleagues. Other instruments use the words “emotional intelligence” but the ECI is the genuine article. How Can the ECI be Used? The ECI can evaluate both the individuals within an organization (Individual Feedback Reports), as well as the organization as a whole (Work Force Audits). These audits can provide an organizational profile for any size group within the company. The ECI can be used to provide clients precise and focused feedback on their strengths and limits. Based on the feedback from a variety of rater groups (i.e., self, manager, direct reports, peers, others), the ECI indicates the specific emotional competencies where development is needed to enhance the individual’s emotional intelligence. For organizations, internal and external consultants can use the ECI to diagnose an entire unit, profiling its overall strengths and development opportunities. Pooling the individual assessments of an entire work unit provides a comprehensive profile of the organizations emotional intelligence. This work force audit can reveal key emotional gaps that may be limiting performance effectiveness. For more information about Emotional Intelligence and how it can impact your bottom line, please visit our blog! 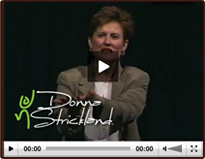 Hire Donna Strickland for a development program by contacting us directly at (303) 808-4880.